Advanced multi-streaming rate real-time H.264. Motion JPEG at 720p resolutions. The GXV3662_HD is a next generation Vandal Dome High Definition IP camera of power and innovation. The innovative AE (Auto Exposure) & AWB (Auto White Balance) algorithms power the advanced ISP (Image Sensor Processor), ensure high-fidelity video qualities and match Digital Still Camera color grade in wide range of light environments. It features cutting edge H.264 real-time video compression (720p resolution) with excellent image clarity at low-to-modest bandwidth, industry leading SIP/VoIP for full duplex 2-way audio and video streaming to mobile phones and video phones, integrated PoE, embedded analytics, large pre-/post-event recording buffer, and advanced security camera protection. Its unique incorporation of the most comprehensive peripheral support for alarm control, local storage expansion, and wireless network connection, creates sophisticated and best-in-class control flexibility and scalability. The GXV3662_HD can be managed with GSurf, Grandstream’s advanced and intuitive video management software that controls up to 36 cameras simultaneously. It offers an HTTP API and has open-standard Onvif conformance for easier operation and higher levels of integration. 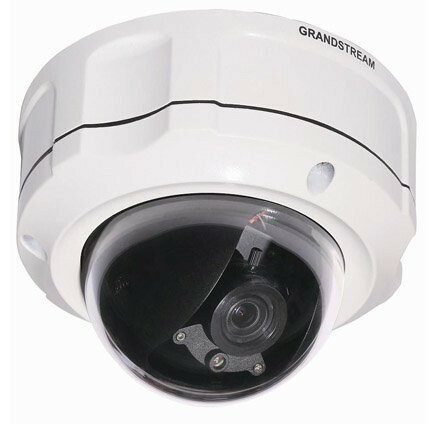 The GXV3662_HD is a powerful network camera for professional surveillance environments. Image Sensor Resolution for version 1.2MP: 1/3", 1.2 Megapixel CMOS, 1280x 960. Image Sensor Resolution for version 3.1MP: 1/3", 3.1 Megapixel CMOS, 2048H x 1536V. Lens Type: 1/3", 3.3~12mm, F1.6~F3.2, DC-Iris; Manual focus: 50cm ~ ∞; H: 89.8°~23.9°; V: 63.6°~17.9°. Operation Mode: Light Sensor, mechanical IR Cut filter, color / black & white mode. Responsivity for version 1.2MP: 5.48V/lux-sec (550nm). Responsivity for version 3.1MP: 1.9V/lux-sec (550nm). Pixel Dynamic Range for version 1.2MP: Wide dynamic range of 120dB with SNRMAX 44dB. Pixel Dynamic Range for version 3.1MP: Wide dynamic range of 100dB with SNRMAX 39dB. Supported Maximum Video Resolution and Frame Rate for version 1.2MP: 1280x960 (30fps). Supported Maximum Video Resolution and Frame Rate for version 3.1MP: 2048x1536 (15fps); 1920x1080 (30fps). Video Bit Rate: 32 Kbps - 8 Mbps, multo-rate for preview & recording. Audio Input & Output: Line-In, Line-Out. Alarm Input & Output: Voltage In < 15V; Output: 125VAC/0.5A, 30VDC/2A, Normal Open. Embedded Analytics: Motion detection (up to 16 target areas). Snapshots: Trigger upon events, send via email/FTP, and stored in SD card. Network Protocol: TCP/UDP/IP, RTP/RTCP, RTSP, DHCP, DDNS, HTTP, HTTPS, SMTP, FTP, NTP. Power over Ethernet (PoE): IEEE 802.3af Class 0. Peripheral Ports: Internal SDHC 2.0 socket to allow local storage. Dimensions (D x L): 153mm x 115mm. Temperature / Humidity: -30°C - +50°C (-22°F-122°F) for DC and PoE, with heater & fan. Power Adapter: Output: 12VDC/1A; Input: 100-240VAC, 50-60Hz. Casing: Vandal resistant, weather-proof with UP66, attachable to mounting kit of 1.875" diameter. Compliance: FCC, CE, C-Tick, IP66.